By the time the barrel patterns were all done it was time for some lunch. And the Cowpokes were hungry. I have kind of made it a tradition that we eat pulled pork BBQ sandwiches. They are so yummy. 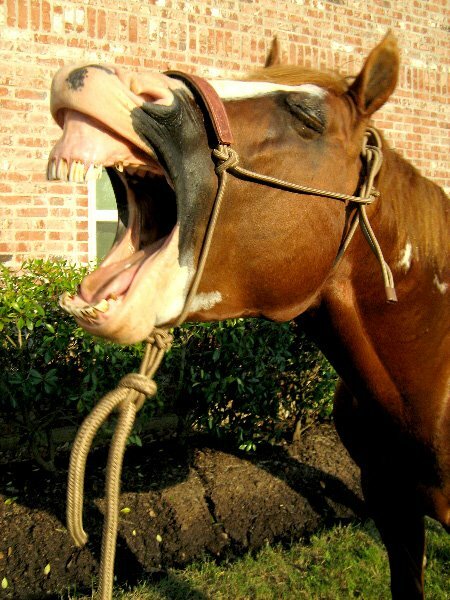 Open up wide!! That is some good cowpoke grub. The Cowpokes always seem extra hungry while we are at rodeos. I pack all sorts of snacks for them to eat. A rodeo isn't a rodeo with out pickles, so I brought those too. We had a great lunch break. And it saves a lot of money making your own sandwiches than it does buying the 3 dollar hamburger. We are all about trying to save money and having fun. I had to go and see what event they were on. Mr. Cowboy held down the fort while I was gone. Mr. 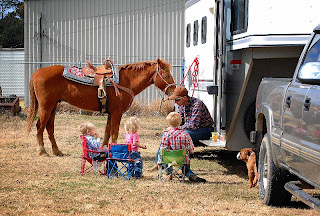 Cowboy is a good Rodeo Dad. He knows how to make all the Cowpokes, horses, and dogs relax. Not long after lunch it was time for Pole Bending. 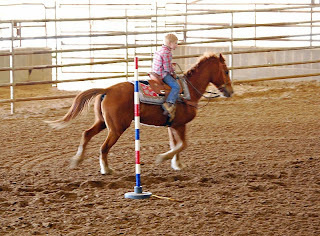 Little Cowpoke's age group does not do pole bending, so it was Big Cowpoke's turn. Since he messed up on the barrel pattern, we made sure he had this one down. We went over and over it. He even told Cowpokette how it was supposed to be done. Cowpokette can't wait until she gets to ride. She was begging all day long to sit on Peanut. Then it was time for Big Cowpoke to show us his stuff. Big Cowpoke had not practiced poles at home. So, he was a big rusty. He made super wide turns. I tried to get him to ride two handed but he wasn't listening. We now know what we need to work on. He also needs to work on those heels, and getting those down. Big Cowpoke's time was a 27. He would have gotten second place, but for some strange reason they gave him a No Time. I went to talk to them about it but it was at the end of the rodeo. They gave me all sorts of excuses and reasons to why he had a No Time. They said he went off pattern. Which he didn't. I was standing in the arena and watched the entire thing. The workers tried to tell me that I would have to argue my point before the class closed. And I found this out at the end of the rodeo. So, I grabbed a rule book and it says that I can argue my point at the end of the event, before the next class, or at the end of the rodeo. I am going to point this out to them next rodeo. That is 5 points that Big Cowpoke lost. But anyway. We met up with some friends while we were there. "D" was borrowing this really cute Appy gelding. 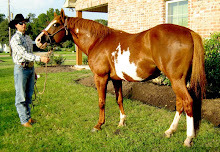 I loved that gelding. He has a super great lope. It was slow and cadenced. He defiantly would make a great Western Pleasure horse. "D" was having fun riding and getting used to this big gelding. I should have got a shot of its rear end. The Appy was really nice. Speaking of nice horses. 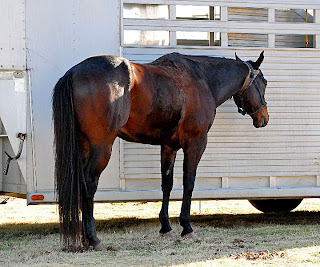 A friend who trailered next to us had this awesome Quarter Horse, that I drooled over all day. I was in love. Couldn't you see me riding that big boy over some fences? 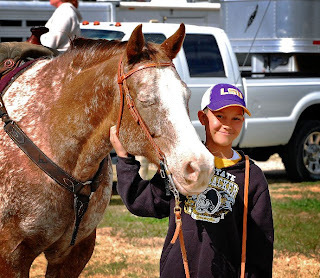 He would be a great Hunter Under Saddle horse. Sigh.......but oh well. We had a great time. 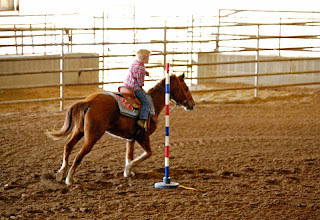 Little Cowpoke rode in three events and got a first place and two thirds. Big Cowpoke rode in five events and got a first place and two fifths. I think they did a fantastic job. I agree~sack lunch is the way to go! It can really cost a fortune to eat at them! I'm drooling, too. That QH is gorgoeus and would make a wonderful hunter. Or is she a he? I can't tell you how many times I have had to argue for Megan when she was little. Video the runs and then you have proof and make sure to let the recorder run long enough so you record the time when they announce it. This tactic has a way of stopping these people in their tracks when they try to "rig" it so a certain other kid wins more. I know...it all kind of takes the fun out of it, because we think of it as something for the kids to enjoy, but there are parents who are only concerned whether their kids win and they will cheat to make sure they do. 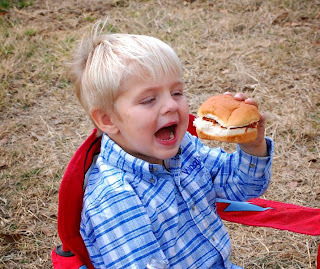 Boy howdy, do I hear ya on packing the lunches, sodas and snacks. Talk about saving the $$$$. Only 3 dollars? We pay 6! I agree I alway pack a lunch when we go to My fellas ropings! Blink blink NO TIME!! WTH Like BEC said Video. Remember my Soccer post? Oh nothing gets a mothers blood to boil like an unfair call on her kiddos! You tell them they better paly fair! Or Auntie Trainwreck will come down and tie their rails!Then be sure and tell them how BIG I am! lol! Great pictures! You have a beautiful family...speaking of beautiful? What is with your photo? It doesn't show up anywhere anymore?? What gives? Love the pics of your kids! You son and daughter on the horse is awesome! Got your comment on my blog! Thanks for the support! 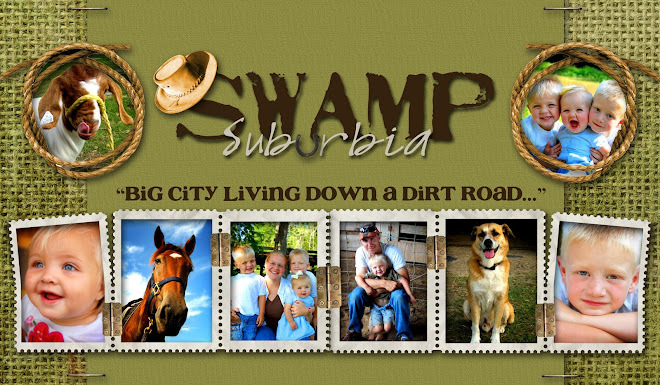 In these small communities we really need to think outside the box! Thanks for offering to post it also - you rock girl! Great photos! And we always take our own food everywhere. That looks fun! 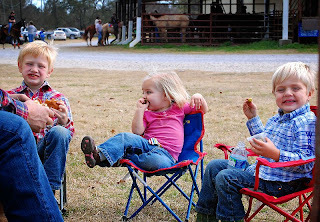 I enjoyed the rodeo pictures of the kids. They look like they had a blast. Pulled Pork is Delish! I'm sure it was better than concession food. Your photos are looking great! Have a great day! ang. Sigh...everybody gets to ride, sigh. Soon - soon I will too. But I should did get my horsey fix on your blog today! Great pics - and I know how frustrating it is to argue a bad call like that is - oh well, at least you didn't just sit there and take it. 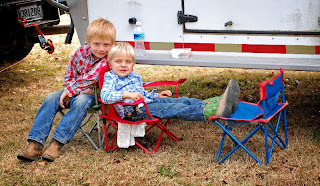 You are teaching your boys to stand up for themselves by example - good for you! Smart you for packing lunches....and MMMMMmmm! 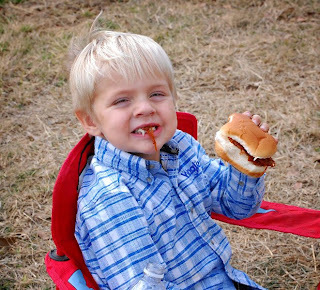 I love pulled pork! That's a handsome appy. I just want to hug that huge neck! Great photos of you family, too! Great job on all the cowpokes in your family!! I'm really glad to hear that Peanut was so good for the kids...you're going to have a great time with him!! 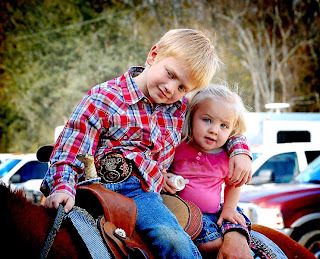 Loved the pic with Big Cowpoke and Cowpokette in the saddle...priceless!